Do you remember when you were a kid and you wanted to hangout in your friends tree house, but they alienated you by saying only “cool” kids were allowed or “no David’s allowed” and you had to watch everyone having fun while your stuck outside all alone? That is exactly how using BeautifulPeople.com feels. The main page of the site doesn’t really make sense. It’s a random collection of people, one person is dancing while there is a woman sitting with a lion and a random seemingly gay female couple dressed in some strange outfits sitting on a fancy couch? When you sign up for the site you need to upload a photo (obviously, since a site that’s so focused on vanity would care about anything else) and wait for 48 hours while the sites members vote whether you’re beautiful or not. What happened to beauty being subjective like art, just because you don’t like something doesn’t mean everyone else does. The site shows you how the voting is going and shows you how close you are to being ”out” or “in”. If your on the upside of you are probably thinking “This site is great” as your self-confidence is boosted by each vote for your beauty, but if your on the other side of the spectrum it will be a different story. - “Activity Stream” gives you real-time updates when members update or add photo’s, and since that’s the only thing that seems to matter on this site the news feed consists of no other actual information. 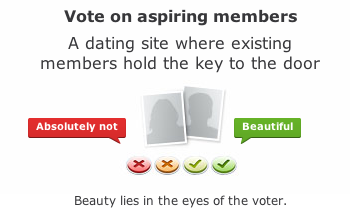 - If you are lucky enough to be deemed “beautiful” by the members of the site then you get the privilege of being one of those judgmental people and vote if other applicants are beautiful or not, and when you don’t think they’re beautiful you have to click “absolutely not” which seems a bit harsh. They could just ask you to select yes or no, but that’s not judgmental enough for this site. - The site boast that you can “Browse beautiful profiles of men and women without sifting through all the riff raff” Although just because a few people though someone was beautiful doesn’t mean that everyone will think so, so in that sense it’s just the same as browsing member profiles on any other site. - The site hosts exclusive parties and events for its beautiful members, does that really sound like all that much fun though? I feel like it would be a bunch of vein narcissist gossiping about each other’s of fits and how so last season they are. - The site also promotes that you will “Meet REAL beautiful people who actually look in real life as they do online” but how can they guarantee that? Someone can easily upload any photo they like and gain access to the site, just like any other site will tell you in their terms and conditions, they can’t verify the information people put on the site. - “Find Friends” by connecting your account with your Facebook, Yahoo or Gmail account and find people you already know on the site or invite your friends to join, assuming their beautiful of course. Wouldn’t it be lovely to invite your friend to use the site only to have them rejected? Seems like a good way to end a friendship. - Profile pages have a section for “Interests” where you can fill out some of your favorite things like favorite movies, books, TV shows or music. It’s nice since you can fill out whatever you’d like. - View members by Top Males or Females, Latest Online, Elite, Applicants or Members in your area. As an applicant you can’t vote on other applicants beauty but you can view their profile and see how the voting is going. I looked at a few profiles of some woman I can’t imagine anyone not thinking were beautiful, but they have 2-3 votes under “absolutely not” so the site certainly hasn’t taped into any sort of dating science. The votes are probably from other woman on the site claiming this as their own. - “Similar Profiles” shows you member’s profiles which are similar to the one you’re viewing at the time. - Start a live chat with a member right from their profile page since the site will tell you if they are online at that moment. - The site has a mobile app for Android and iPhone users. There is on huge drawback I can think of, and there is certainly more than one. The whole site is based on one simple thing, subjective beauty. The whole principle is flawed since not everyone shares the same opinions when it comes to the subject of beauty and what someone like someone else may not. The site wants to connect you with the most beautiful people, but all I think about when I read that is that these are the most shallow, vein and judgmental people on the internet. I wouldn’t want to go on a date with anyone who actually uses this site since the whole time all I would be thinking about how this persons main concern is beauty, because out of the choices of online dating website they chose to use the most vapid one. BeautifulPeople.com goes against every principal I have tried to maintain while participating in the world of online dating. I just want to believe that having a connection with someone is based on more than just someone’s appearance, so why would I waste my time on a site like this? I suggest you don’t subject yourself to be voted on and don’t waste your time with it either.